A Meditation on St. Joseph – Happy Feast Day! 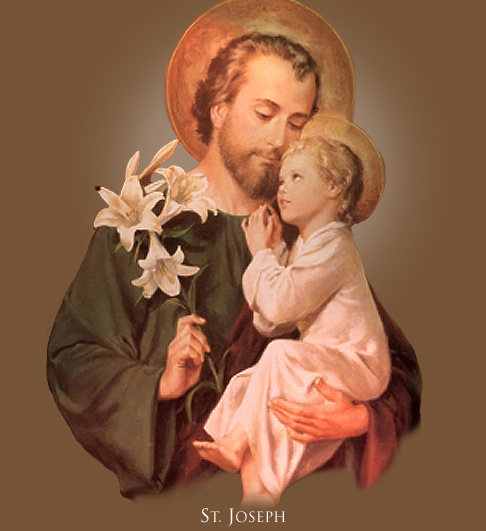 Among the responsibilities that came crowding into St. Joseph’s life after he discovered that all innocently he had taken as his betrothed the one who would be Mother of God, that which must have frightened him most, I should think, was that of being “father” to a Child who is God. It was not that his love was wanting. Joseph had dedicated his life to God. He longed with an ardor like Mary’s for the coming of the Messiah. A devout Jew felt so keenly the greatness and majesty and unspeakable mystery of God that even Christ, when He called His Apostles, let recognition of His divinity come to them slowly. To have known unmistakably at the outset would have put such a gulf between them as to make impossible the intimacy He needed with them in order to teach them as He wished. And here was Joseph, having lived a most holy life, deeply recollected, far advanced in prayer – asked to be “father” to the Messiah! One gasps at this sort of thing. “But I’m afraid … I can’t … I don’t know … I’m not good enough .. . what will I do?” These must have been somewhat his sentiments. Then the angel said to him, “Do not fear….” and we see that it was God’s will that Joseph be Mary’s husband. He could do what he could do; beyond that, he could do no more. Apparently it did not dawn on this humble man that he could do what God had prepared him to do. Do not doubt that he had been prepared. 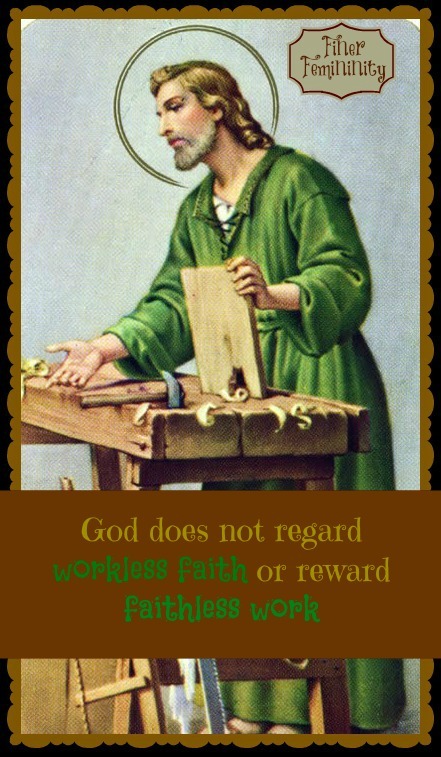 St. Joseph did not just happen along during the preparation for the Redemption. He had been chosen, as Mary; and although he was not given her Immaculate privilege, in every way he was God’s work. Strangely enough, what God needed for His divine Son was a father, and that was not a role to entrust to just anyone. He was to be father in the everyday sense of the word. This Boy could not grow up and prepare for His mission out of some bizarre situation where there was no father. There must be nothing irregular. He must have a mother and a father, relatives, a craft, a home, a town – everything ordinary that boys have. At least they must have the appearance of the ordinary; if they were extraordinary, no one need know – now. The only answer to the puzzle of how to raise the Child who was God was to raise Him as every Jewish boy was raised: with the help of God, perfectly. We assume, of course, perfectly. He was God. He was perfect. As though our Lady and St. Joseph were puppets with no will, no judgment, decisions of their own. She was full of grace; so her will in every matter was perfect. He was full of love of God and dedicated to Him; so with grace his will was perfect, too. But it is not as though they had no choices to make. Aside from the approval of his marriage, the message to go to Egypt, or the message to return, no divine revelations told Joseph how to father the Christ Child. He had what all Jewish fathers had as guide: the Law, and that was all. The pattern was given by God: parents have authority over their children; children are bound to respect and obey their parents. And St. Joseph had, as reservoir to draw on, his own rich personal life with God out of which he drew his wisdom and formed his decisions. It was the father’s role to decide where they would live, and Joseph had to make this decision a number of times. He must have learned once and for all on Christmas Eve that it would be up to him to decide. No angel appeared that night to show them a lodging. It was his role to teach this Boy to pray the prescribed daily prayers, to conduct Him and His mother to synagogue, where He sat with His father, and on pilgrimage to the Temple in Jerusalem to offer sacrifice. He taught Him His trade and, with it, how to barter honestly, how to fix a just price for his work, how to evaluate wood, a respect for tools, the techniques of a good workman. He taught Him of crops, for almost every Jewish craftsman depended partly on the food he could grow to help support his family. If we read our Lord’s parables over and see how many of them tell of the works of a man – building, planting, harvesting – we have a clue to the things Joseph must have talked about with Jesus. If Joseph waited for some sign from this Boy that He could do His growing and learning without any help, it did not come. He did the things all boys did, but with a graciousness and beauty that must have made Joseph think of Adam before he destroyed the harmony of his nature. Joseph must have wondered how He would redeem men. He must have watched Him sometimes and wondered when it would begin. He must have known, suddenly – and then as though he had always known it – that he would never see it. But He gave no sign. Joseph was as fully and wholly and totally obligated to be father to this Child and husband to His Mother as any other Hebrew husband and father. Our present Holy Father has said, “The mother of the Head is the mother of the Body.” Then what of the father? The Divine household, which Joseph governed as with paternal authority, contained the beginnings of the Church. The Virgin most holy is the mother of all Christians since she is the Mother of Jesus and since she gave birth to them on the mount of Calvary amid the unspeakable sufferings of the Redeemer. Jesus is, as it were, the first-born of Christians, who are His brothers by adoption and redemption. From these considerations we conclude that the blessed Patriarch [Joseph] must regard all the multitude of Christians who constitute the Church as confided to his care in a certain special manner. This is his numberless family, scattered throughout all lands, over which he rules with a sort of paternal authority, because he is the husband of Mary and the father of Jesus Christ. Thus it is conformable to reason and in every way becoming to Blessed Joseph, that as once it was his sacred trust to guard with watchful care the family of Nazareth, no matter what befell, so now, by virtue of his heavenly patronage, he is to turn to protect and to defend the Church of Christ. With Christ as our Head, we are the Church. We are St. Joseph’s family. Family life was the only life St. Joseph knew. He was not a monk or a hermit or a priest or a bishop. He was a husband and father. It is significant. The Child was the Priest. The father taught the Child who became High Priest, who offered Himself in sacrifice; who paid for the sins of men. For all the years He spent with His father, He showed the mark. He was formed by the father as well as by the mother; Joseph and Mary, husband and wife, father and mother, prepared this Boy for His vocation.